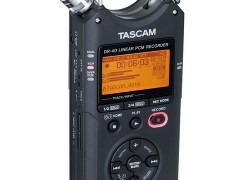 The TASCAM DR-40 is a compact and ultra-high quality portable digital audio recorder. I needed a solution to the “tinny” audio that some of my video devices were producing. Even the best video cameras seem to have this problem. I love TASCAM products. They’re focused on quality and everything I’ve purchased from them in the past has under-promised and over-delivered. This is a product that comes with a manual, but really doesn’t need one because it’s so easy to figure out. It even comes with three “AA” batteries to get started. The only things they don’t put in the box are thumbs. I suggest getting two of those. Figuring out how to use the DR-40 is pretty intuitive. I’ve rarely consulted with the manual except for some fine tuning. You can watch one of my video blogs to hear the audio quality of this device.